Is actually mini banana muffins with chocolate chips in them! We host an informal playgroup on Mondays and purely by coincidence i had overripe bananas and made these two weeks in a row. Now one of the little dudes requests them every time he comes to our house! Heat oven to 350. Mixed mashed bananas with sugar, then add egg and melted butter. Whisk flour, baking powder and salt together, then add dry ingredients to wet and stir until combined. Stir in chocolate chips, then scoop into mini muffin tins lined with paper muffin cups(or very generously greased-these are sticky muffins!). Bake for 15-20 minutes, until brown and a skewer comes out clean! 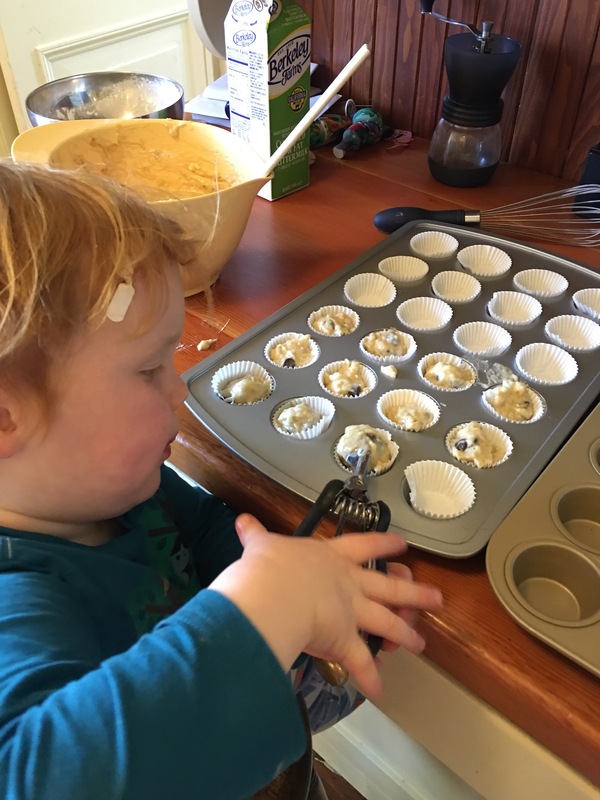 World’s best muffins – Lou asks for them every 6 minutes. Keep telling him we are waiting for the bananas to get brown enough….